Up until now unemployment has been defined in terms of supply and demand of jobs. It has rarely been defined as “supplies” (plural) and “demands” (plural) for jobs. To put it simply, you have the supplies and demands of jobs for teachers, engineers, lawyers, construction workers, delivery workers and so on. Even in the narrow category of teachers for example you have supplies and demands for jobs. The supplies for jobs in teaching come from evening cram schools, private day schools, public day schools, specialized schools, alternative schools, elementary schools, middle schools, high schools, or even some universities which offer remedial classes or initiation classes. The demands come from teachers who may be certified to teach various subjects or who may think of themselves as able to teach various subjects. The same could be said of every narrow or broad category of job. How do you define employment? Most textbooks will use six broad categories of employment which include: agricultural workers, artisans and craftsmen, industrial workers, business owners, “the professions” or “the intellectual professions” and finally service providers. These are broad debatable categories as some would include freelance language interpreters in the intellectual professions category while others will include it in the service provider or even business owner category. This makes defining employment complicated. Some forms of employment demand the employee to pay in exchange for exposure, another service or experience, meaning that some people either pay money or invest money in order to provide services to other people. For this very reason, it would be safer if economists and labor institutes defined employment exclusively in terms of time spent providing a service in exchange for a direct cash reward. Unfortunately however, employees themselves sometimes prefer defining as employment any time spent providing a service even when they actually invested or paid money in order to provide such services, as many employers demand experience or exposure as a prerequisite for hiring. At the microeconomic level, I would define mass unemployment as “lack of available paid employment within reasonable travel distance from the home where the economic agent lives.” This definition assumes that people would inevitably take up employment even when such employment does not fit their training or skills, if paid employment opportunities were available. I like to differentiate between unemployment and mass unemployment. Someone on a sabbatical, someone between two jobs, someone taking rest from a traumatic work experience or taking time off for any reason, or someone who for health or addiction reasons can not take up employment in an area where employment opportunities are largely available are one thing. However, in an area where healthy individuals can not find paid employment within reasonable travel distance from their home, that would be mass unemployment. How do you fix mass unemployment? Three factors: housing and transportation being the first, availability of paid employment and investment being the second. Unnecessarily complex bureaucracy and cultural factors would be the third factor. There are two main factors for mass unemployment at the macroeconomic scale: economic poles located too far away from residential poles or massive concentration of wealth by few individuals or companies leading to what I call “you can’t beat them but you can’t even join them” phenomenon. In the Bolivarian countries of Latin America, Africa and some Asian countries, the industrial poles are located far away from residential poles either because of weather factors (it’s too hot in the industrial pole) or to geographic factors (the mines are high up in the mountains where no one lives or can breathe normally.) This leads to only the most needy or adventurous people taking up jobs in such areas, either people with families to feed or people who often failed to succeed in the cities and have to take up jobs in the industrial zones. In case of massive concentration of wealth by a few companies or individuals, such massively wealthy individuals rarely reinvest their wealth in forms of private job-creating investments as such investments would cause competition against their own company. This means that their companies are the only stable forms of employment available in the area, leading to massively high competition rates for jobs. That’s when I repeat “you can’t beat them but you can’t even join them” meaning that if you invest in your own company you can’t compete with massive companies or conglomerates, while in order to join them you have to compete with thousands, sometimes hundreds of thousands of others to get the job. The East Asian model is notorious when it comes to the application of this model. 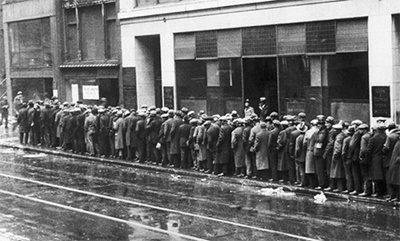 The two models that I describe above face a dilemma when it comes to mass unemployment. In the first model, if you create sustainable industry in the cities where most people live, higher-revenue industries such as oil, gas, mines or agriculture would have to be abandoned as most rational individuals would leave their jobs in distant farms or oil fields to work in the cities. In the second model, larger companies tend not to want to help individuals set up businesses that would directly compete with them, and tend to either buy or hammer down businesses that directly compete with them. In the latter model, the notion of anti-trust would need to be negotiated between the government and such very wealthy business owners. Finally, in terms of “supplies” and “demands” for jobs, the geographic distribution of supplies and demands is the main factor. Either too much geographic concentration or too little geographic concentration tends to affect employment as a whole. If jobs are located in one single venue, too much wealth tends to be concentrated by a single clan, family or individual, and in such cases competition for jobs becomes ferocious, but so does the “opportunity cost to get jobs” with expenses in education, housing or even plastic surgery for example. If jobs are scattered around different poles located far away from residential districts, families tend to be scattered all over the place. This is where the bureaucratic model kicks in. You want it to be easy for people to find jobs but difficult for consumer trends to disappear and not the other way around. Simply put, you want to prevent the concentration of too many restaurants in one area, too many pubs in one area or too many fast-food joints in one area. In sum, you want bureaucracy to prevent the easing of competition by defining what is legal business competition and what is illegal business competition. Alas, once again as a reader I am presented with a purely positivistic empiricist side of the coin of unemployment offering measurements, quantification, breakdowns into categories, statistics, polls galore, and triumphantly presenting itself as a Eureka "enlightened" moment of the intellect, while all along ignoring the humanistic approach. But what one ends up with is at best, half of a complete picture or half of the coin. To get to the complete picture we first need to read the various dissertations (not excluding those of Plato, the social encyclicals of various Popes in the last two hundred years, and Karl Marx's analysis of what causes unemployment among the working class) on distributive justice vis a vis human greed, as in fact amply discussed and examined in the pages of this very magazine in the last ten years or so. To have the whole coin the two have to be harmonized. One would hope that such is the case, for till that is properly done and accorded a minimum of time and attention an incomplete positivistic approach, alas, will unfortunately continue to delude itself that it has found the Eureka key to solving the problem of unemployment when in reality it has just counted the trees and missed the whole forest. Indeed, we moderns living within modernity have found the enemy, and it is us! Come to think of it, could such a conclusion also be a Eureka moment? Those inquisitive readers who may be wondering where the above mentioned discussions on Positivism vs. Humanities took place in Ovi, the above link may serve as a beginning. There are a dozen or so other such discussions also worth consulting.